Today while I was asleep in the afternoon, my son came and wake me, removing the curtains, saying it was time for evening prayers. Outside it was dark with street lights on. When I got up, he told me that he was just joking about the time. In fact it was only 6 PM but there was a severe thunderstorm outside which had turned the day into night. I laid my hand on the camera and took a few shots (one of them as above). The wind was so strong that it was difficult to go out and stand in the open. So I took photos from inside the hose behind the window. The windstorm was followed by a downpour, which brought the mercury down quite a few degrees. This was a welcome sign as we have been having very high temperatures for the past few days and rain was needed badly to bring us some relief. 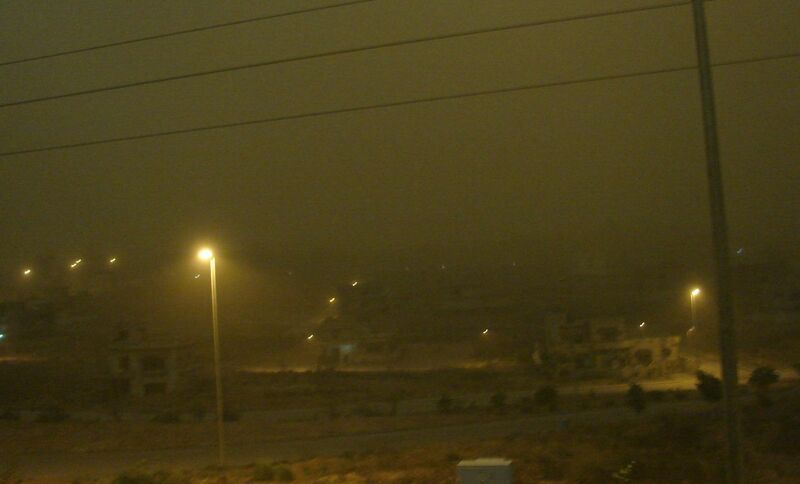 That kind of weather is welcomed in Lahore however elders say that its not a good change. 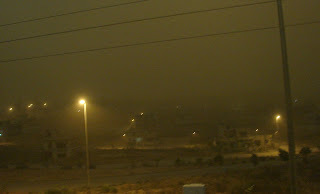 We could not feel the thunder but had a dust storm here in Lahore. There is always some fun living on heights - Lahore lies too low to have charms like islo.